Can Dogs Eat Oranges? 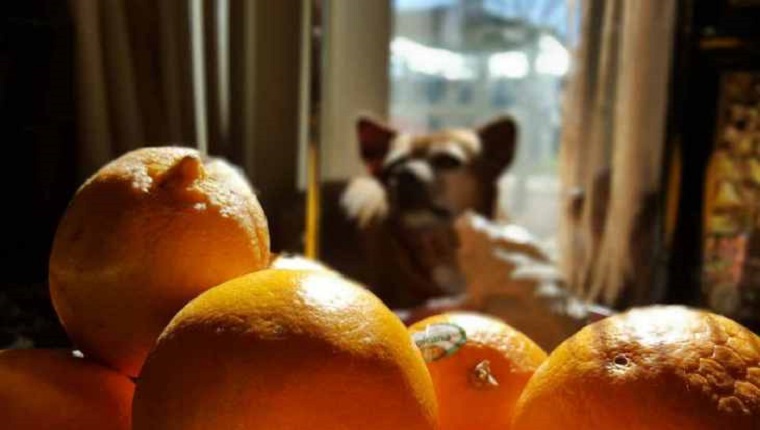 Are Oranges Safe For Dogs? Can dogs eat oranges? If you’re looking for the quick answer, it’s yes. However, the full answer is not so simple. There are some things you should know before feeding oranges to your dog. For most of us humans, an orange can be a sweet and nutritious snack. But as a pet parent, it can be hard to peel an orange while you find your dog sitting patiently in front of you, hoping for a tasty treat. Before you think about tossing a segment of this tart citrus towards them, make sure you ask yourself that very important question–should you feed your dog an orange? Although there are more than a few human foods that are poisonous to dogs, oranges are not on that list. But like all foods, too much of a good thing can, well, be a bad thing. For one, how much of an orange you should feed your dog will depend on their size. Smaller dogs may eat a quarter of a moderately sized orange, while larger dogs can eat the whole thing. You also need to consider parts of the orange that your dog can or cannot eat. For instance, make sure you don’t feed them the rind, nor any seeds from the orange. However, if you feed your dog an orange the right way, it can make for a healthy treat. Here are a few benefits and hazards to feeding your dog an orange. How Are Oranges Good For Dogs? One of the biggest health benefits an orange can offer for dogs–and us–is Vitamin C, which can provide a boost to their immune systems. Other nutritional benefits include fiber, potassium, iron, and is low in sodium. A healthy dog naturally produces vitamin C in their system. But an orange can be a great treat for dogs, especially those that are highly active or highly anxious. Under these circumstances, your dog’s liver functions might need a little help producing enough vitamin C. This is where having an orange can prove beneficial. 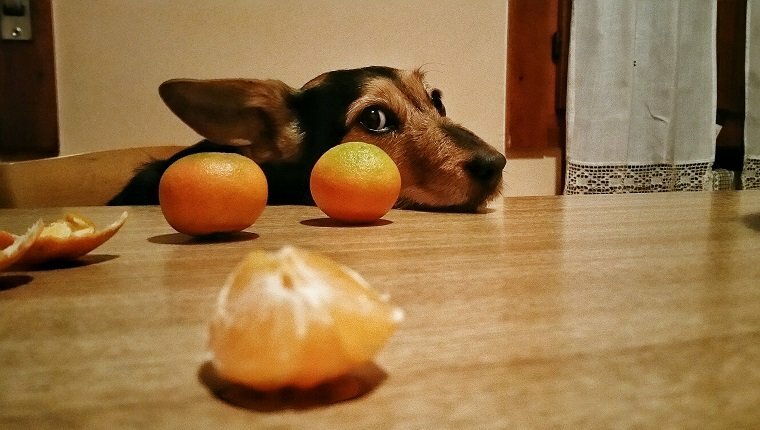 When Are Oranges Bad For Dogs? In addition to oranges being packed with vitamin C, they are also filled with natural sugar. Feeding your dog too many oranges–or if they are a smaller breed, a whole orange–can cause them to have an upset stomach due to too much sugar in their system. This can lead to digestive and/or stool concerns. If your dog is diabetic, this might not be the best fruit to snack on, either, as it might cause a spike in their blood sugar levels, which can lead to serious problems and a trip to your local vet. Another thing to watch out for is the parts of the orange, as not all of them are recommended for your dog to eat. The rind is packed with vitamin C, but if digested by your pet, might cause blockage in their digestive tract or gastrointestinal issues, or they can even present a choking hazard. You will also want to avoid seeds and the pith, which is the white lining attached to the fruit. Should You Feed Oranges To Your Dog? Oranges can provide a mixture of great benefits for your dog. However, moderation is key. Also, being aware that the actual fruit of the orange is the only part you should give your dog. A good suggestion is to try naval oranges as they do not have seeds in them. Make sure to also consult your dog’s veterinarian to find out how much of an orange you can feed your dog, as well to learn what other fruits might be good or hazardous to their health. And also be aware of your dog’s medical condition, as it will impact what they can or cannot eat. Do you feed your dog an orange as a treat? Do they like them or they too tart? Let us know in the comments below! Can Dogs Eat Strawberries? Are Strawberries Safe For Dogs?